The Blue Cabin by the Sea is a cosy, comfortable hideaway cottage in a beautiful, small, private cove in the Scottish Borders. Only accessible through a rock-cut smuggling tunnel and across a beach by foot, or by sea, a holiday at the Blue Cabin by the Sea offers exceptional comfort throughout the year. The Blue Cabin by the Sea sleeps up to four people, with two bedrooms, one double and one twin with bunk beds, shower-room with shave point (bedding & towels are included), a fully equipped kitchen and a living room of exceptional character with wi-fi and tv. 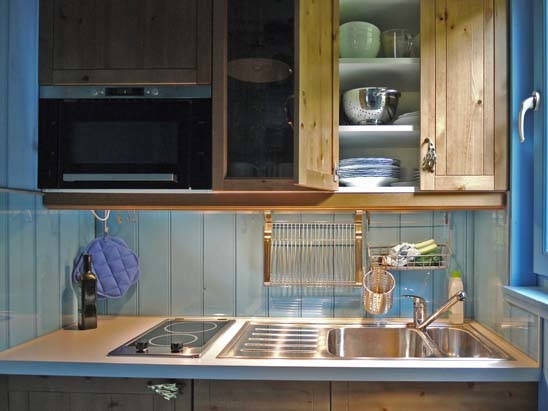 The Blue Cabin is cosy: it has electric heating and fuel is supplied for the stove.